The Suogdru are toad/frog shartha whose driving motivation is the enslavement of everything around them. 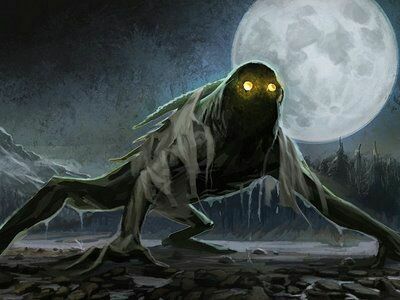 They unbalance the shadow by finding a potent locus and corrupting it in their image, often by flooding it and ritualistically offering carrion, compost, and offal. They drive out all spirits except the ones they find pleasing, such as spirits of sloth, gluttony, frogs, insects, water, plants, etc. Once a Suogdru is able to assert control over a locus it immediately extorts any spirits that desire essence from the frog host’s locus. Help advance the Suogdru’s control or never return. This dramatically alters the local shadow as they reign over the area as gluttonous, indolent kings. This can lead to flash floods in the physical realm as well as sudden influxes of invasive insects and toads, locals often slow down, growing more weary and resigned while drug overdose and obesity increases. Suogdru enter their host by crawling in the victim's mouth and inhabiting their belly, causing the victim to slowly develop an "Innsmouth" look while full hybrids are enormous amphibious humanoids with great claws, teeth, and venomous barbed tongues. Suogdru can be a particularly grievous threat as each desires to reign over its own locus and if allowed to spread unchecked a Drowned Prince will eventually emerge among their ranks to reign over its kin and ensure the spread of its progeny. Suogdru are rulers first and foremost. Therefore powerful toad hosts existing within the same area are about as likely to occur as with Azlu. However Suogdru do see lesser specimens of their kind as peons, much like the many spirits that serve them, however they do tend to place greater value on their Suogdru servants than they do upon others. Suogdru are also very fond of establishing cults among mortals devoted to worshipping the corpulent beasts. This is usually managed by preying upon the suffering of those near a Suogdru's territory. Claimed or Urged emissaries often promise safety, wealth, and a communally working society where everyone has a place they belong in and no one goes without work if only you pledge yourself to their esoteric faith. While these overtures are hardly guaranteed to succeed, Suogdru are patient creatures and the decades have often paid off for these monsters, rewarding the mightiest of them with surprisingly large and well entrenched cults in the strangest of places. Last edited by Star Sage; 12-16-2017, 02:03 PM. A Tremors sort of host would be cool.